Email us at customercare@applesofgold.com with the item# to check future availability. VIEW OUR CHRISTIAN JEWELRY CATEGORY FOR OUR CURRENT SELECTION. Cross of Nails pendant crafted in the actual shape of nails in 14k yellow gold. Cross measures 1 3/8" tall (1 9/16" tall with hoop) x 15/16" wide. "But we speak the wisdom of God in a mystery, the hidden wisdom which God ordained before the ages for our glory, which none of the rulers of this age knew; for had they known, they would not have crucified the Lord of glory" (1 Corinthians 2:8). 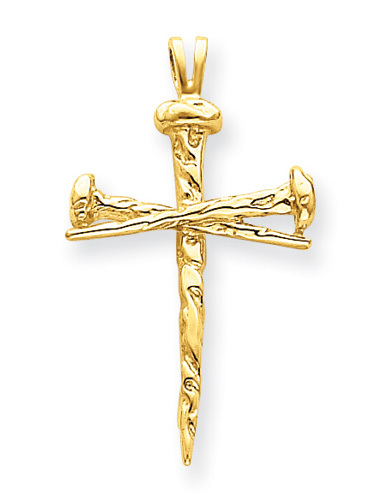 We guarantee our Nails Cross Pendant, 14K Yellow Gold to be high quality, authentic jewelry, as described above.